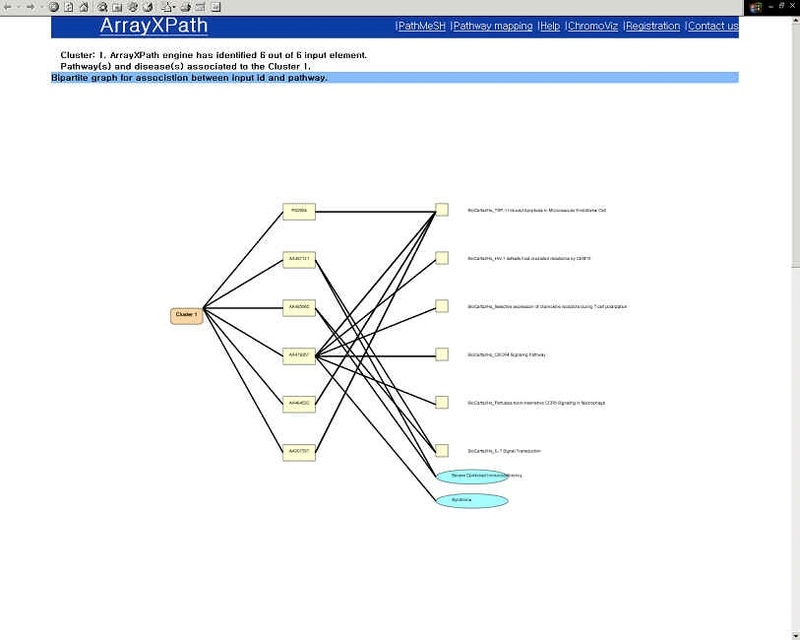 ArrayXPath integrates the quinta-partite graph structure of cluster, gene, disease, pathway and GO-term associations from multiple resources. <Probe ID>-<Cluster ID>-[<Expression level at conditioni>]. The first row must contain column heading (i.e., ID, ClusterID, condition1, condition2, ...). The first column must contain either GenBank accession, UniGene ID, LocusLink ID, SwissProt ID, TrEMBL ID, or official gene symbol. Affymetrix probe identifiers can also be used. The second column has cluster IDs. * When you also want to visualize filtered-out profiles before clustering, put 'NA' as the cluster ID for the filtered probes. The third to i-th columns are optional and contain expression levels across experimental conditions. 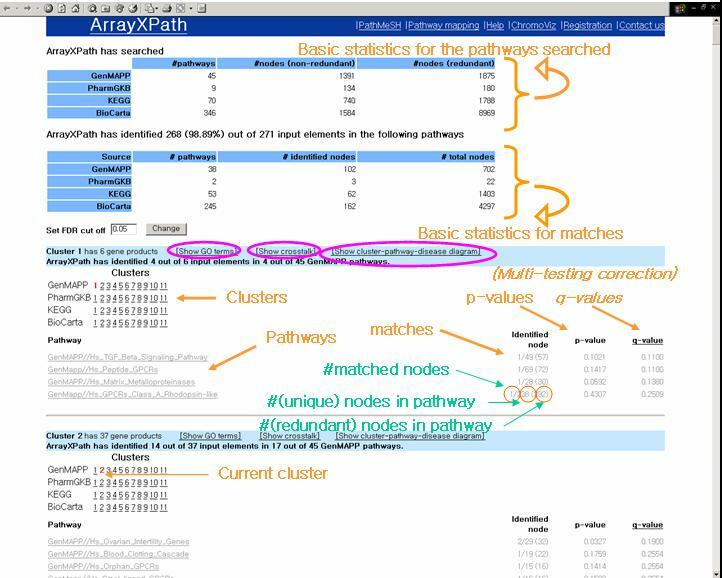 ArrayXPath dose not perform cluster analysis. The input format is designed primarily for partitional clustering algorithms (i.e., K-means and Self-Organizing Maps) but clustering results from hierarchical algorithms (i.e., dendrogram) may be applied by choosing a threshold carefully. Download and install SVG Viewer plug-in from Adobe. 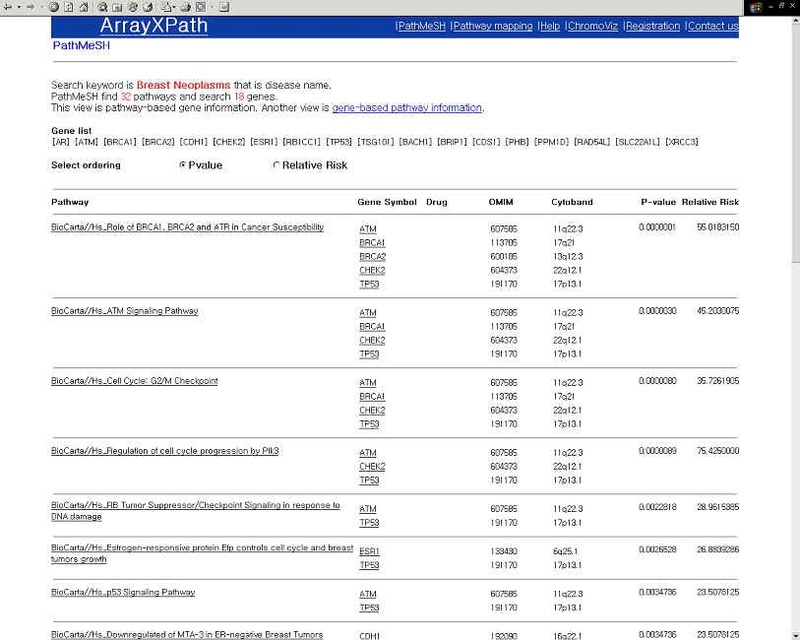 Submit your gene-expression cluster data (see input to ArrayXPath). You can choose the correct taxonomy (i.e. Hs, Mm or Rn) and statistical testing. Browse the matched pathways with statistical scores (i.e. p- and q-values). Select the pathway of your interest. Each node has link to gene information page by the GRIP (Genome Research Informatics Pipeline) engine at SNUBI. Browse the pathway color-coded with gene-expression levels. 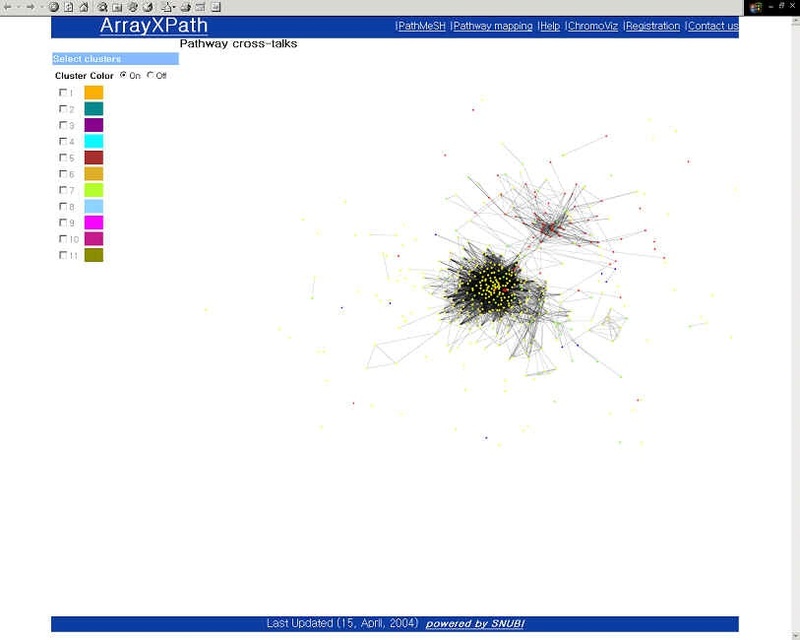 Example 10 clusters from the Human HeLa cell-cycle data analyzed by ArrayXPath. 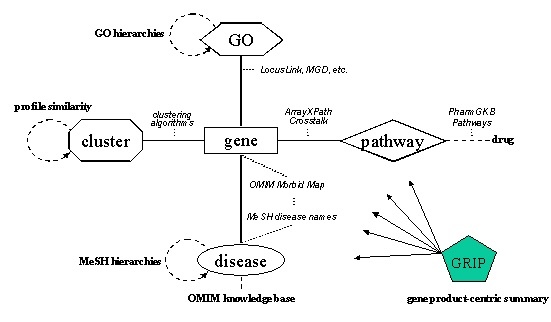 Browse the list of the pathways containing the disease-relate gene product. Browse a broad view of pathway crosstalk clustering patterns within a cluster. Upload your expression profile to find the best matching pathways! 10 clusters from the Human HeLa cell-cycle data analyzed by ArrayXPath. 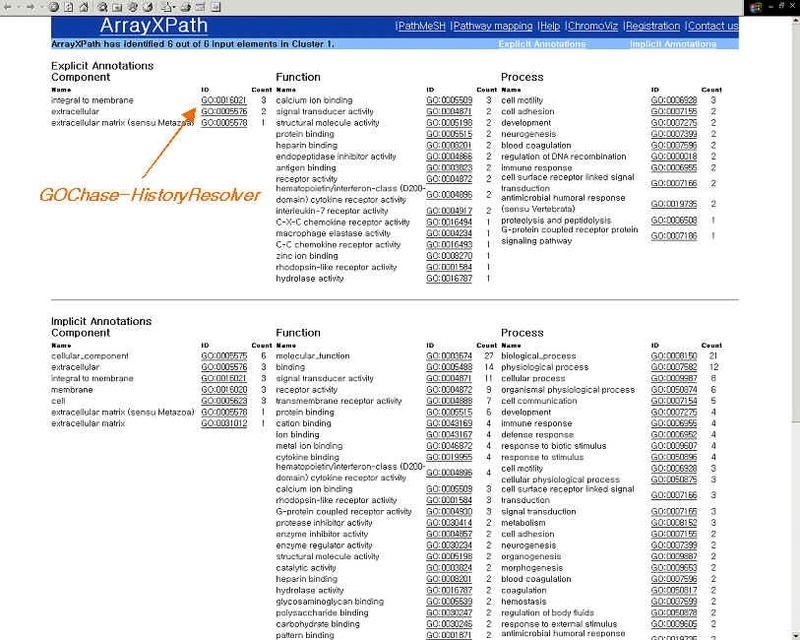 100 clusters from the Human HeLa cell-cycle data analyzed by ArrayXPath. 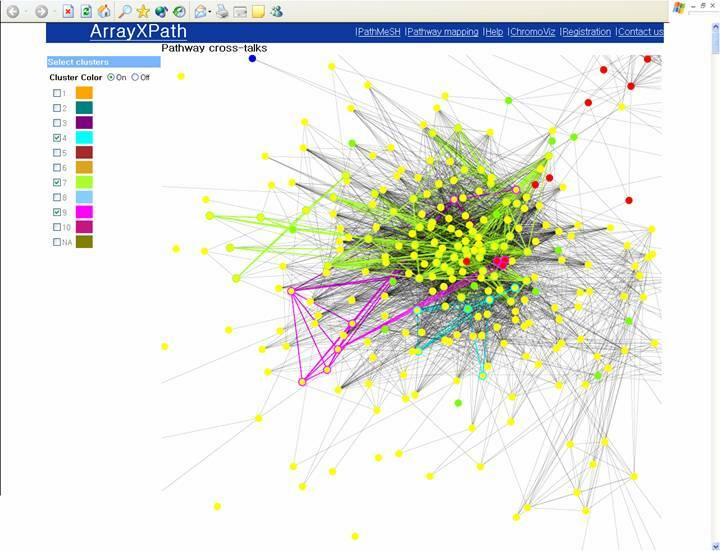 50 clusters from the Mouse kidney data analyzed by ArrayXPath. Hs. HeLa cell-cycle data set clusters 1, 2, 3, 4, 5, 6, 7, 8, 9,10, NA (to save time). Our dataset submitted to Gene Expression Omnibus (http://www.ncbi.nlm.nih.gov/geo/) under accession numbers GSM15078-GSM15092, GSE954-GSE958, and GSE969.